Creating and then perfecting a good recipe is always a happy occasion especially when it is a dish that you have always loved and craved. The recipe for this Tahchin Morgh is that recipe for me. 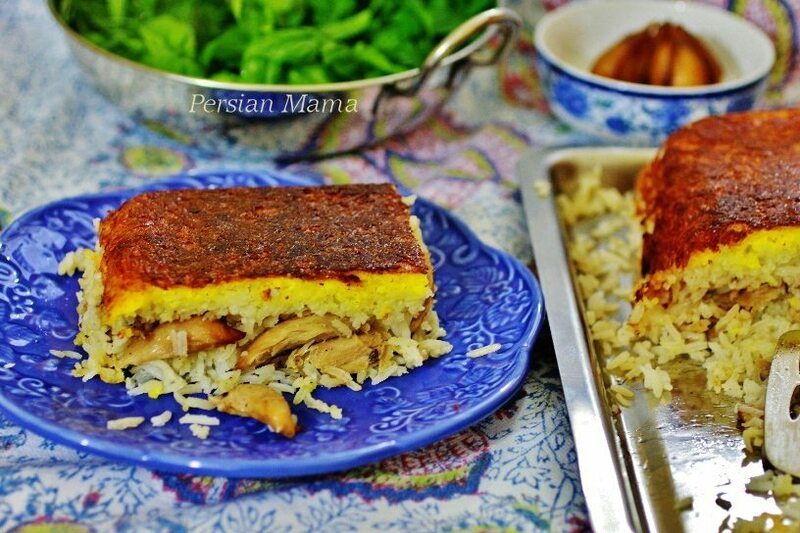 It is comforting and delicious with lots of tender chicken in the layers and it has a buttery TahDig that is to die for. I have made this Tahchin Morgh more times than I can remember because my family and friends love it and ask for it frequently. There is no guesswork with this recipe; if you follow the directions you will get the perfect Tahchin with a crispy golden TahDig every time. 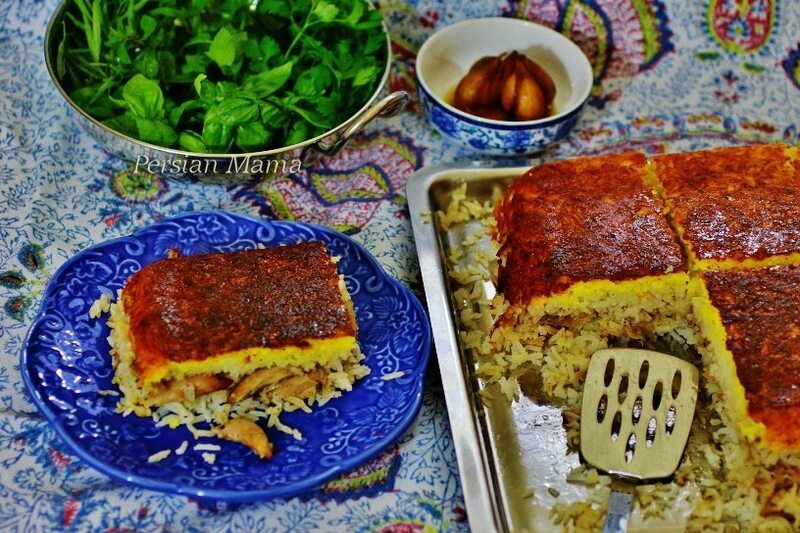 Tahchin Morgh is a delicious comfort food with an elegant presentation without too much fuss. There are different types of Tahchin in Persian cuisine and all of them involve layering rice and some type of meat with other ingredients, such as this other Tahchin post on my blog, Tahchin Lubia Cheshm Bolboli ba Mahicheh. 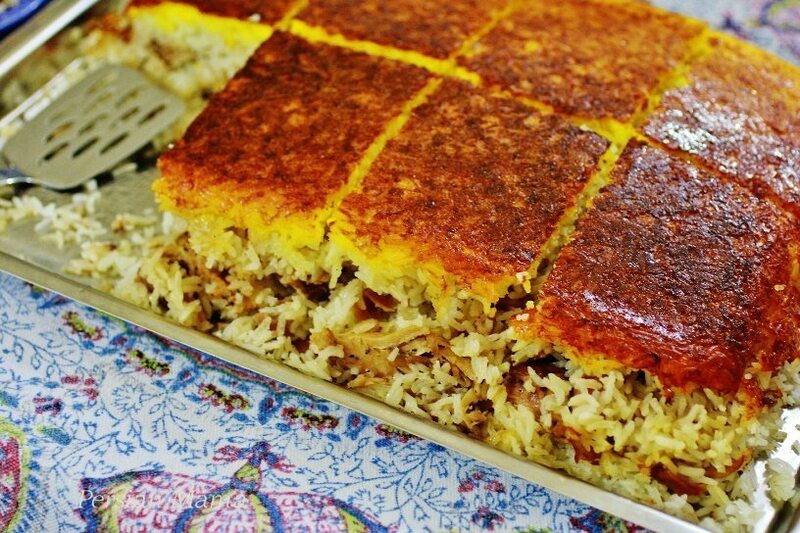 Tahchin Morgh has a simple technique; basically it is aromatic fluffy rice layered with cooked chicken. 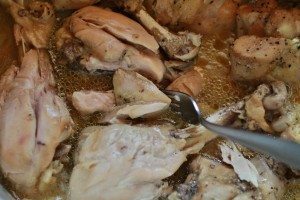 What makes it special is that chicken thighs, or drumsticks, or a combination of the two are cooked with pieces of onion, salt, pepper and little water until the meat falls off the bone, then it is layered with cooked rice. Choosing chicken pieces with bone and the use of small amount of water is the way to cook very flavorful chicken with an extremely rich broth to steam the rice with. Tahchin means “arranged in the bottom” and Morgh means chicken in Farsi. This recipe is the Tabrizi (Azeri) version of the Tahchin and is different from the recipes that mix all of the rice layers with the yogurt and saffron. 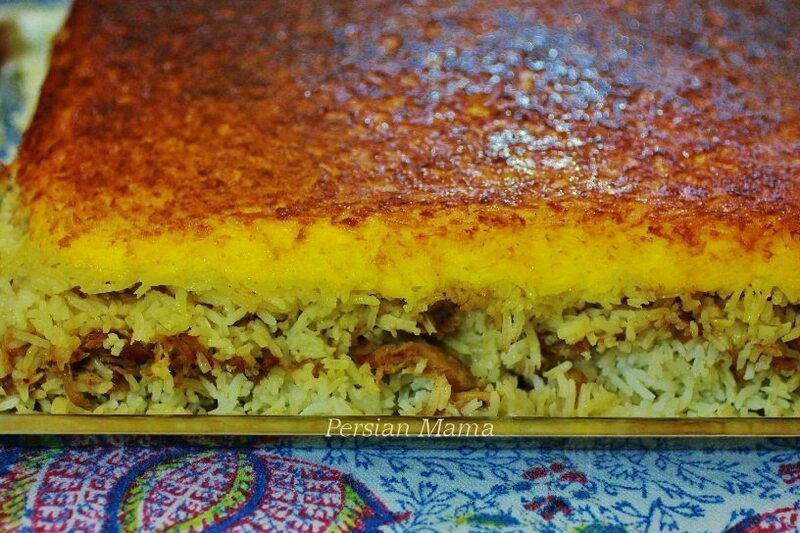 In this recipe only the bottom layer, or TahDig rice is mixed with yogurt and saffron. So while the TahDig layer bakes into a crispy golden crust, the rice is steamed with the rich chicken broth and stays fluffy and light. 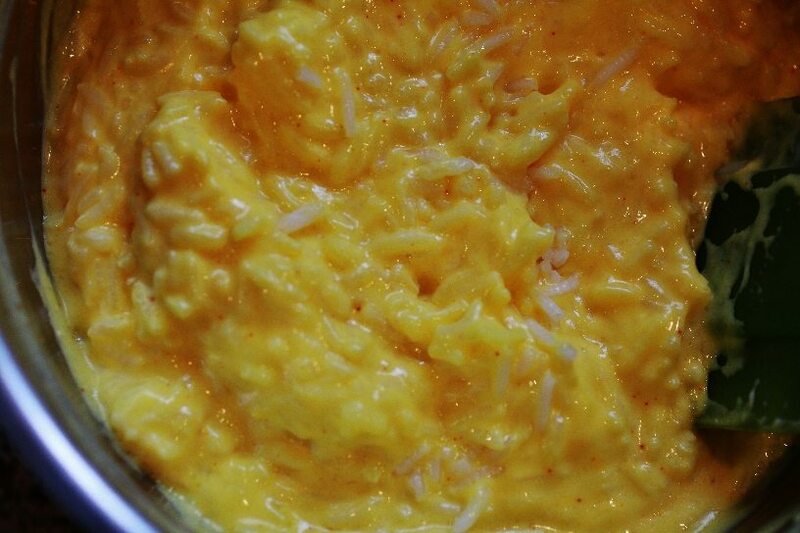 My Tahchin has four layers: The bottom layer is a mixture of cooked basmati rice, yogurt, egg, and saffron. The next layer is aromatic basmati rice and Persian Rice Spice. The third layer is the flavorful and tender pieces of cooked chicken. 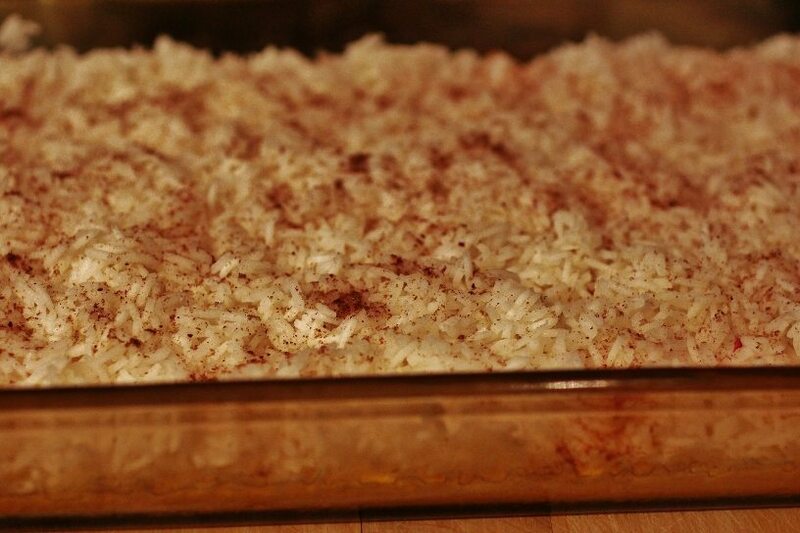 The last layer is more basmati rice sprinkled with rice spice. 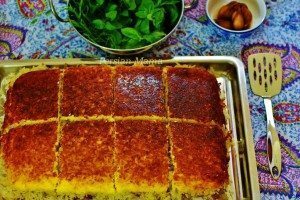 To make this Tahchin taste buttery and amazing some cold butter is added on top which melts into the rice as it bakes in the oven. 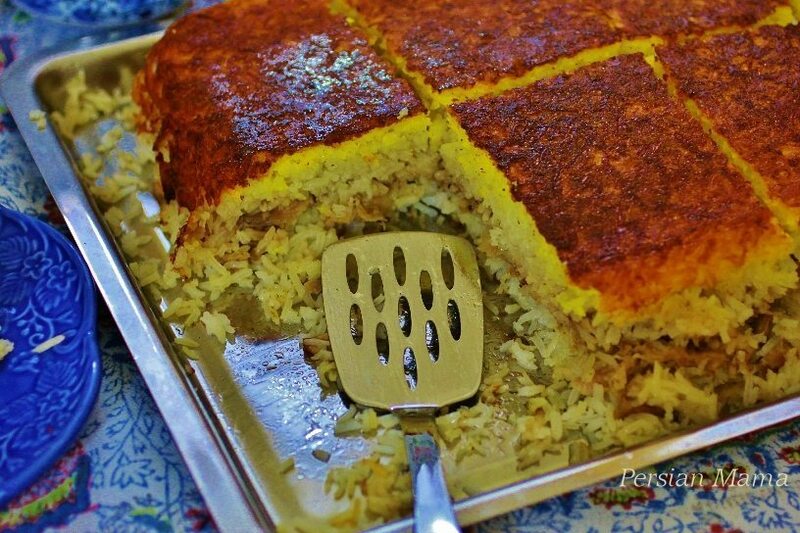 Persians love their TahDig and the majority would agree that it is the most delicious part of a rice dish. Making this Tahchin in a rectangular form has a huge bonus! TahDig means “the bottom of the pot,” which in this case is the crispy layer in the bottom of a large baking dish. 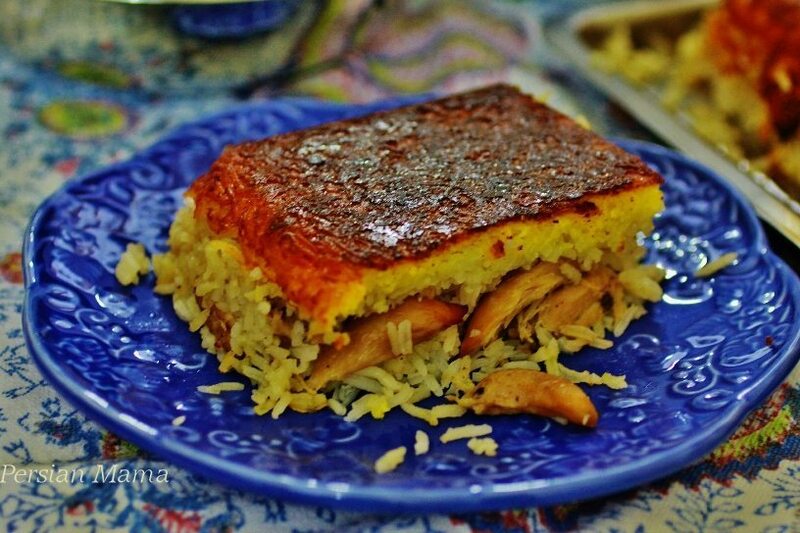 If you are one of those people who can never get enough TahDig, you will love the very large piece of TahDig that comes with each serving of this all time favorite. Tahchin Morgh is baked with a beautiful golden TahDig and it is inverted onto a rectangular serving platter or a shallow baking sheet and cut into equal pieces. This simple dish becomes an elegant centerpiece that deserves all the praise, and it is usually served with Sabzi Khordan (fresh herbs), Torshi Sir (pickled garlic), or Salad Shirazi. 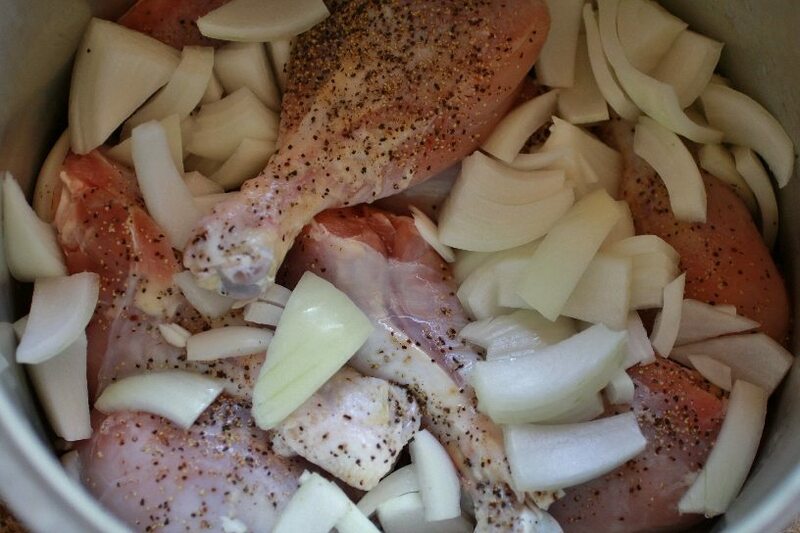 Cook the thigh and/or leg pieces in little water with onion, salt and pepper until it easily falls apart with a fork. Remove the chicken from the pot and boil the broth to reduce. 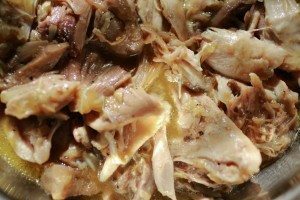 Remove the meat in big chunks from the bones, add to a bowl and stir in the reduced broth, chill for at least 30-40 minutes. 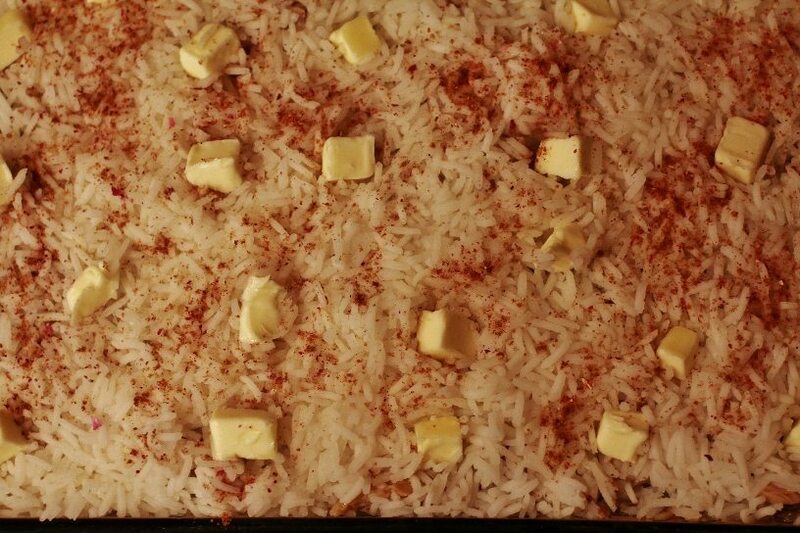 For the second layer add half of the remaining cooked rice to the baking dish and sprinkle 1/2 tsp Persian Rice Spice. For the third layer add the chilled chicken and broth mixture. For the fourth layer add the remaining rice evenly on top of the cooked chicken, sprinkle the top with 1/2 tsp rice spice and add the cubed butter on top. Cover the baking dish with aluminum foil, make some cuts in the foil and bake. After 1 hour and 15 minutes remove the baking dish from the oven. You should be able to see some golden brown color along the bottom of the glass dish without lifting it. Do not over bake, the bottom of the Tahchin bakes darker than the sides. Since the oven temperatures vary, the first time you make this Tahchin you might have to adjust the time according to your oven. If the sides are not golden brown, return the dish back to the oven and bake for another 7-10 minutes, or until it is golden brown. Remove the foil, run a knife along the sides of the baking dish to release the Tahchin. Place a large shallow baking sheet or a rectangular serving platter over the baking dish. Hold the baking sheet and glass dish together with mittens and invert. 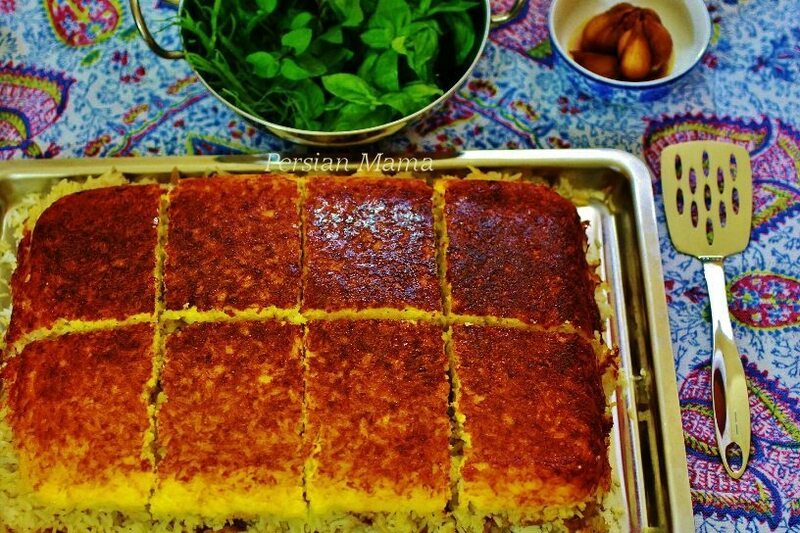 Remove the baking dish and let Tahchin Morgh sit for 10 minutes on the counter before cutting it to 8 equal pieces. To cook the chicken: Add the skinless chicken pieces to a stockpot with a good lid that will not allow too much moisture loss. Add salt, pepper, the cut onion and 1 ½ cups water. Bring it to a boil, then reduce the heat to medium low and cook for about 1 ½ hours, or until the chicken falls apart very easily with a fork. Remove the chicken from the stockpot and set aside to cool. If there is more than 1 cup of broth in the stockpot, bring it to a boil and let it boil for 3-5 minutes, or until it is reduced to 1 cup. Turn off the heat. Pour the reduced broth into a medium bowl, smash the cooked onions with a fork and set aside. When the chicken is cool enough to handle, take all the meat off the bone in large chunks. Mix the meat with broth until it is well coated. 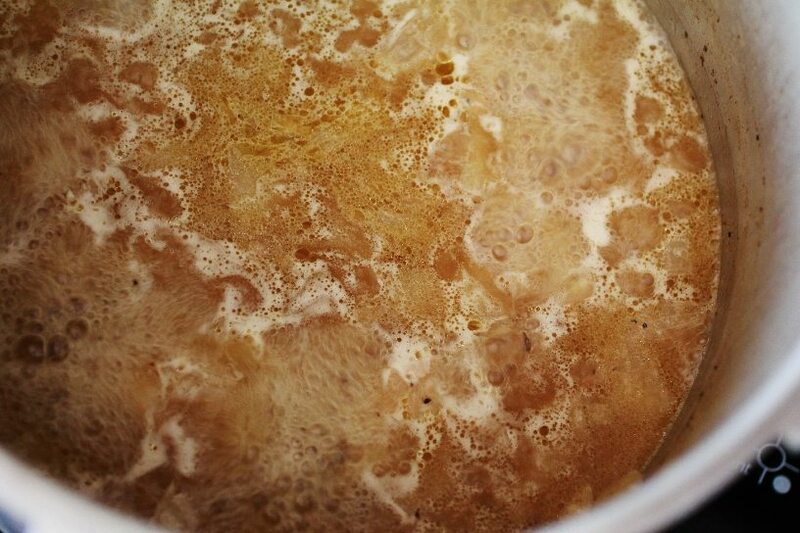 Chill the meat and broth mixture in the refrigerator for at least 30-40 minutes, or until the broth solidifies. This step may be done up to 3-4 hours in advance. 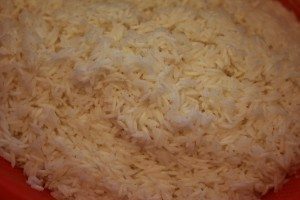 To make the rice; Follow my previous blog post Persian Steamed Rice using 4 cups of basmati rice up to point where the rice is partially cooked, added to colander and rinsed under cold water and drained completely. Set aside. To make the Tahchin: Place the oven rack at the lowest setting. Preheat oven to 400 F.
Add 5 tablespoons vegetable oil and 5 tablespoons butter to a 9 x 13 x 2 inch glass baking dish. Place the dish in the preheated oven 3-5 minutes, or until all the butter melts and starts sizzling. Watch very closely so the oil does not get too hot and cause a grease fire. Using mittens transfer the baking dish to a heat proof surface. First layer: Add the rice and yogurt mixture to the baking dish and spread evenly to cover the bottom of the dish. Second layer: Spread half of the remaining rice evenly on top of the yogurt mixture and sprinkle the rice layer with ½ teaspoon Persian Rice Spice. Third layer: Stir the chilled chicken and broth well and arrange evenly on top to cover all of the rice layer. Fourth layer: Add the rest of the rice on top of the chicken, press gently with the palm of your hand. Sprinkle with ½ tsp Persian Rice Spice. 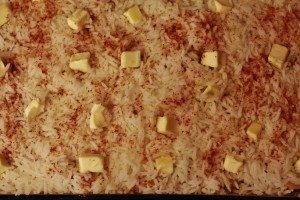 Arrange the cold butter cubes on the rice layer with equal distance from each other. Cover the baking dish with a sheet of heavy duty aluminum foil and seal the sides by pressing the aluminum foil to the dish. Use a sharp knife to cut one slit on each corner and then a few in the center of the dish. Bake on the lowest rack of the preheated 400 F oven for 1 hour and 15 minutes, or until the lowest portion of the sides of Tahchin are golden brown. Do not overbake; the bottom will bake darker than the sides. Since the oven temperatures vary, you may have to adjust the baking time the first time that you bake this Tahchin. If the lower sides are not golden brown, return the Tahchin back to the oven and bake for another 7-10 minutes, or until it is golden brown. Remove the baking dish from the oven, remove the aluminum foil. Run a knife along the sides of the baking dish to release the Tahchin. Place a large rectangular platter or a shallow baking sheet on top of the dish. Use mittens and hold both platter and the glass dish and invert the Tahchin. Let the Tahchin sit on the counter for 10 minutes. Use a serrated knife to cut the Tahchin into 8 equal pieces and serve with Sabzi Khordan (fresh herbs), Torshi Sir (pickled garlic), and/or Salad Shirazi. 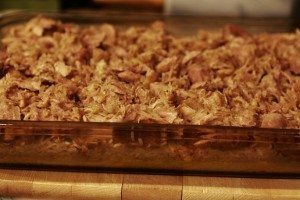 Make Ahead Tips: You could make the tahchin earlier in the day according to the recipe, all the way up to adding the cubed butter, covering the pan tightly with aluminum foil and then making the small slits on the foil. At this point refrigerate the tahchin until you're ready to bake it; then leave it out for 30-40 minutes while you're preheating the oven. Then bake it according to the recipe. I am making this tonight!!!! love it, mercy mercy mercy!!! Dear Farzaneh, Nooshe jan and you’re very very welcome. I would love to hear back from you. Thank you for your comment! It was a delicious! Getting the bottom part to be the color I want was tricky! also I had to play with the amount of yogurt to make sure it is all diluted after cooking. I added zereshk when I turned it around. It was very good! thank you for sharing! I am thinking of using a non stick stove pan next time for better coloring of tahdig! Farzaneh joon thank you for writing back about your experience. So glad you liked the taste. It might take a couple of times adjusting your oven temperature or the dish you’re comfortable with using, but I’m sure next time your TahDig will be perfect too. Using zereshk on top is a great idea! Thank you Homa Jan for your recepie. I followed your recepie step by step and I made Tahchin for the first time for my children. It was so delicious and everybody loves it. Keep up posting more recepie of delicious food. Hello Shahla jan! It is a pleasure to read your kind message here. I’m very happy everyone liked the tahchin. Please keep in touch and let me know when you try my recipes on the blog. Have a great weekend. The nonstick is a great idea. I’m going to try it too. Farzaneh jan; I’m truly touched by your lovely comment about the memory of your dear mom’s cooking! Thanks you! I’ve had this dish on my mind ever since I read Marsha Mehran’s “Rosewater and Soda Bread”. Your beautiful pictures make it even more mouthwatering! Can’t wait to try it! Julie, thank you for writing back. I saw the picture of your Tahchin, it looks amazing! Are those sliced almonds on top? what a great idea. So glad you liked it. The TahDig also looks great and I’m certain you will get the color that you want in no time. I will be enjoying my good read inspired by you 🙂 my “rosewater and soda bread” arrived in the mail yesterday! This is one of my all-time favs! I don’t bake mine, though. Love the way yours turned out. Going to try your recipe this w/end. One of my faves! Excellent recipe and tutorial! Yum! Thanks Fae, it is mine too! This was my favorite dish in Iran. I can’t wait to try it! That is awesome! I hope this is as wonderful as you remember. Please share your thoughts and picture with everyone when you do try it! I just made this dish. It was quite good. Thank you for sharing the recipe. However, we have a lot left over. Can it be frozen? If it can be frozen, any suggestions for reheating it? Thank you so very much! This is very helpful. Homa Jaan; I must say this recipe of yours for Tahchin is absolutely DEVINE. Made it last night with some changes, used all vegetable oil (as for health reasons). Used a non stick pan, adjusted the oven shelf to 2nd up from the bottom. Per your advise to another reviewer adjusted the temp. to 450 for the first 12-15 min. (opened the oven door to listen to the sizzling of tahdig), at that point lowered the temp. to 400 and baked for 55 min. since could smell the wonderful cooked aroma of the rice. 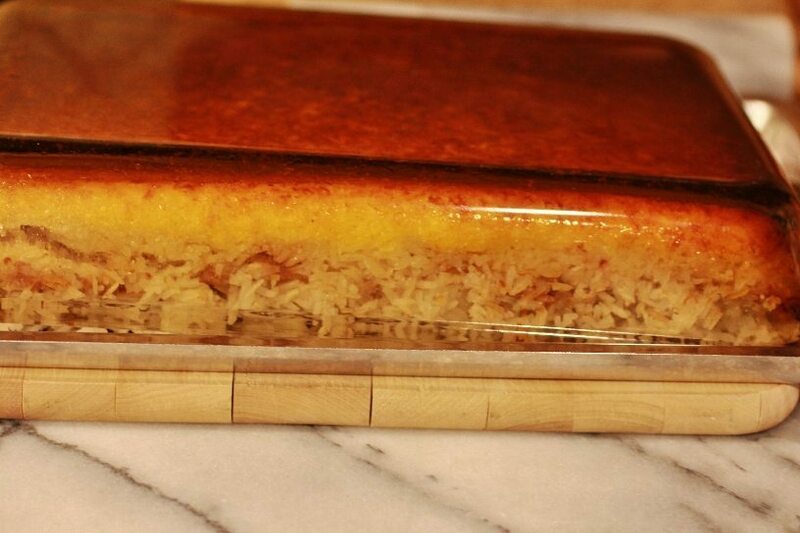 This is such a great recipe to serve at a party as well, since each guest will be able to have a piece of this great rice dish, just like having a piece of cake, but even better. Ferryal jan, I am very happy to hear that your Tahchin turned out to your liking. The pictures you have sent me are absolutely gorgeous 🙂 I loved reading your comment. Thank you so much for sharing your Tahchin experience with all of us, I am certain the other readers will benefit from your input as well. Thanks Homa Jaan for sharing your recipe with us all, can’t wait to try your other recipes. As we say in Azarie, “Sagh Olasan”. I have pinned this for future use. It looks incredible. theoldfatguy, thank you so much for visiting and your nice comment. 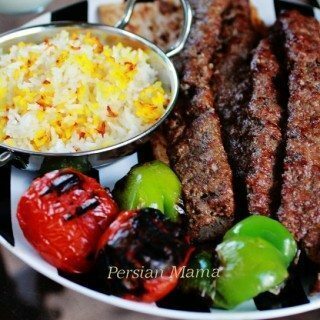 I hope once you make this recipe, you will let me know what you think of this very traditional Persian food! I have to admit to being nervous about diving in as this is a totally different cuisine to me. I have had Persian food served to me (loved it) but never tried. Ever since I saw this post I’ve wanted it. Next week it is going to be tried and I will report back. theoldfatguy, how very exciting!!! Trust me there is nothing to be nervous about; I’ve seen pictures of some amazing food coming out of your kitchen 🙂 I am looking forward to hearing from you and your first time experience with Persian cooking. I hope I didn’t mismeasure something. The yogurt/egg/rice/saffron mixture seemed very fluid, so I cut back some on the chicken broth. We cooked a rotisserie chicken with onion down to a nice rich broth, a couple of days ago, and in assembling this dish this afternoon, we used the breast meat from another rotisserie chicken. Is that cheating? 🙂 Probably! but they’re comparable in cost to raw chicken here. 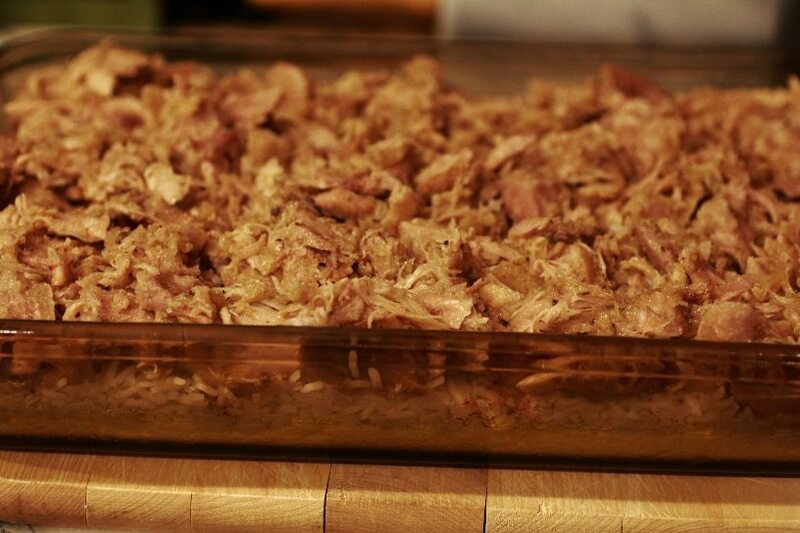 Our tahchin-morgh is in the oven now, and we’re really looking forward to trying it. Had to delay for the delivery of the spice mix. I ended up buying it from Amazon. I got this one: https://www.amazon.com/gp/product/B01AS3X9SS/ref=oh_aui_detailpage_o00_s00?ie=UTF8&psc=1 The spice mixture sure smells good and the rose petals add a very exotic note. I love rose petal jam…! We lived in Turkey for two years in the 80s, and have met so many wonderful Persian people in the time since. Honestly have never met anyone from Iran whom we didn’t like. As long as I can avoid liver and eggplant, I’ve never met a food from that area I didn’t like, either. This sounded so good. I wouldn’t have turned the oven on in an Oklahoma summer for anything less! It came out absolutely perfect. What a marvelous dish! A friend recently invited me for lunch and had layered in a row of baked eggplant in addition to the chicken. It was a delicious version I had never tried before. I’m Stana, travel writer, and recently came back from beautiful Iran and I’m very keen on replicating the recipes I loved the most. So far there is one recipe though that I can’t remember for its name and it’s very similar to the recipe on this post. It was basically a dish of rice and in the middle of the rice (hidden) was lamb stew. 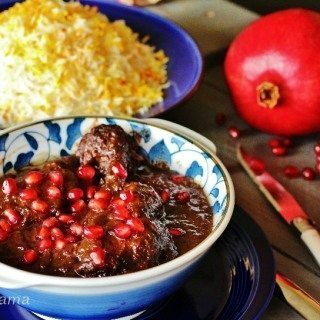 I remember eating it in Shiraz, could you please tell me its name and how to prepare it? I am in the midst of looking at two tahchin recipes, Before I found yours….and am agonizing over the type of pan, and the lack of liquid…..I have marinated chicken in 1 cup yogurt, and am supposed to drain the marinade….it is pretty solid…no draining possible! Can too much yogurt hurt the flavour….ie using more yogurt with the egg in the rice? Should I use a cast iron fry pan (VERY heavy to turn over!) or would a spring form pan work?? Hi Molly; thank you for writing to me. Without seeing the entire recipe it is difficult to know exactly what is involved, but I will do my best. I’m guessing the chicken is cooked then marinated; otherwise the tahchin method would not work. The yogurt will be fine, just remove most of it. Melt 2-3 tablespoons of butter and toss with the chicken pieces before layering with the par-cooked rice. I’ve not used a cast iron frying pan or springform pan for tahchin; I don’t think cast iron is suitable for steaming the rice in the oven. If using springform pan, cover the bottom and sides with aluminum foil before using. I use oven-proof glass 9x13x2 or 8x8x2 pans, depending on the recipe; a metal round or square cake pan will also work. I hope this helps; let me know if I could answer any further questions. Salaam, Homa Khanoom. I made your recipe for tahchin e morgh and it turned out to be the sort of Persian dish I could only dream of! My Persian husband absolutely loved it, and your directions made it into culinary perfection. I made the half recipe version, but two tbsp. yogurt was only 1/4 of the full recipe so I increased that to 1/2 cup (about 8 tbsp.) I also LOVE the advieh berenj recipe which I’ve never had with rose petals (I use golab to make saffron rice). The tahdig was to die for! Keili mamnoon, Homa jaan! I love your posts and can’t wait to try more of your recipes and suggestions. I make lots of Persian food, but you have so many amazing ideas and recipes that I look forward to trying. I’m also going to share your blog with my Persian friends. Salam Mia joon; I’m very happy to hear that your tahchin was a success. 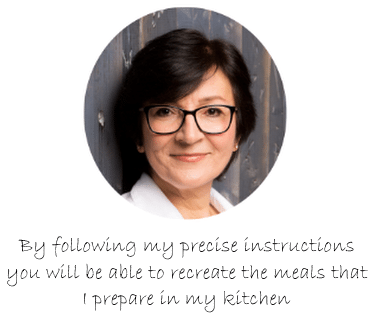 I would love to hear what other recipes you try and thank you so much for sharing my website with your friends; the more the merrier 😉 I really appreciate your lovely comment; have an amazing weekend! 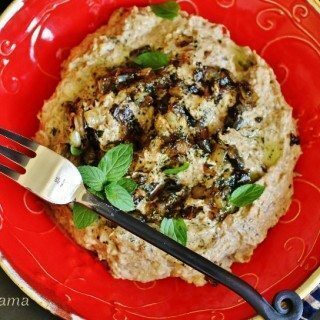 Dear Homa, I have been looking for a good Tahchin recipe and I’m pretty sure I found it! 🙂 I want to practice with the smaller version though. So for the smaller version I still need to use one cup of the broth with for the chicken layer? I did it and it was perfect! 🙂 Thank you so much! Hi Homa! I have been researching many recipes and could you share with me why you only mix the yogurt with a portion of it as others will do it throughout? You’re recipe looks awesome! I’m just very curious as to why you have this adjustment! Hi Christina; it’s a personal taste, and this is the way my family in Tabriz has always made this tahchin! I happen to like a thinner yogurt section that cooks through, with a crispy tahdig and fluffy rice. I feel when yogurt/egg mixture is mixed throughout, it overpowers the rest of the flavors and makes the rice sticky and heavy. The only way to decide for yourself is to make both my recipe and one of the other recipes that you’ve found and see which one you like the best. Let me know what you think. Happy cooking! I really loved your Tahchin recipe and it came out with a lovely tahdig and aroma from your Advieh Polo ! I really want to know the other way we can make tahchin that utilizes yogurt throughout the body of the tahchin ( like in the Tehran Bazar restaurant!) —please teach us that as well! Also, I wanted your input on this Azeri Tahchin recipe of yours as my polo and morgh under the tahdig was too loose in the platter and not in a nice cubic contained format? —what did I do wrong?–also maybe my tahdig was too thin of a layer..how thick should the tahdig layer be in this recipe? So happy to have found your informative site! Hello Homa, I am boiling the ? as I write. I’m curious about what to do with the mashed onion. I’m so excited to try this as I’ve made tahchin before but never with the spices. Also, I choose your recipe because the others don’t use the whole egg which is so necessary for binding the rice. You’re so welcome Roshan! Cooked onion is mashed and mixed into the reduced broth and tossed with cooked chicken pieces before you refrigerate the chicken for a few minutes. Would love to know what you think of this recipe 🙂 Nooshe jan! You could, but the meat will not be as juicy and moist. I’m back in action and made this tonight. I have a ceramic 13×9 and I could only fit three cups of cooked rice in it. I also cut back the butter and oil a little. It came out a tiny bit darker than yours, but was it totally delicious. Glad I ventured beyond khoresh. It’s so good to hear from you Allison! Welcome back! I’m happy you’ve given this recipe a try and enjoyed it. My 9×13 glass pan has a 3-Qt capacity, with outer dimensions of 9 1/2 x 13 1/2 x 2 1/4 and it fits all the rice, with some gentle pressing on top; it does get pretty full though. It is wonderful that you were able to get the tahdig right the first time; each oven has different settings, so you might want to bake it for a few minutes less next time to get a lighter crust. 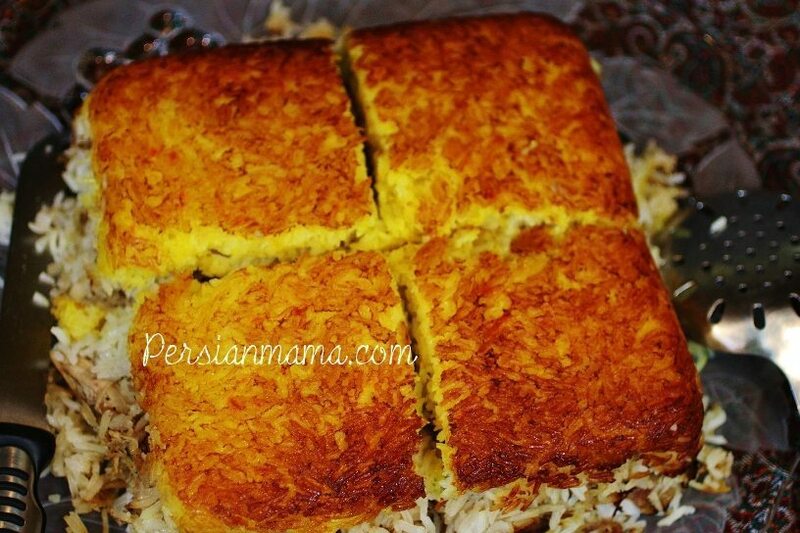 Do you think it’s possible to make this Tahchin recipe using the PARS Automatic Persian Rice cooker? This is the only way I can make great TahDig consistently since my gas range/oven is very old. It’s similar to your Lavish TahDig, but some steps are rearranged. 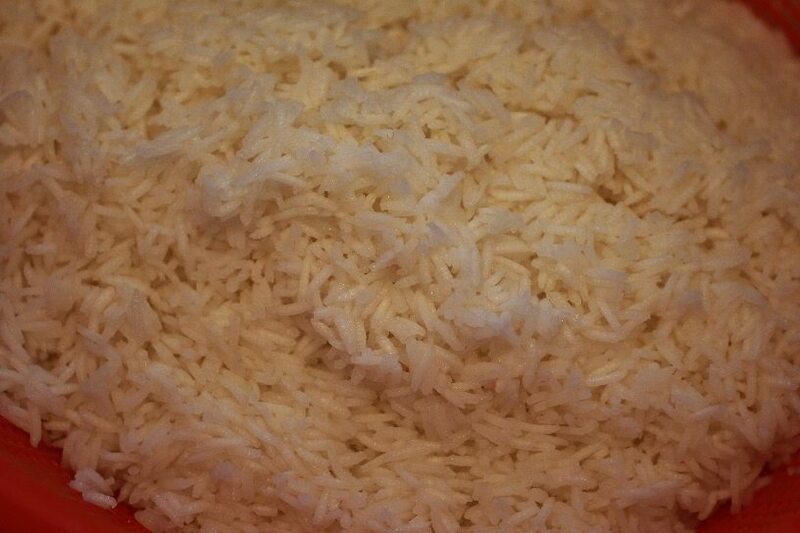 You wash the rice, strain it well, then mix it with vegetable oil in a bowl. You put the lavish on the bottom of the pot with a little oil, then put the rice/oil mixture on top of the lavish, then carefully pour the water in. Turn the knob to 50, and the perfectly brown Lavish TahDig comes out every time. Is there a way to use this tool for Tahchin? Hi Lee, I find your technique for lavash tahdig very intriguing! I’m going to give it a try next time I make lavash tahdig in my rice maker. 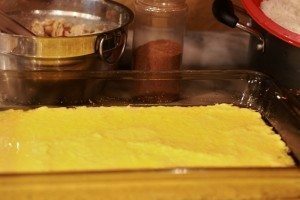 However, I don’t think it will work for the saffron/yogurt/egg tahdig for tahchin, since the ingredients will dilute in water and won’t have the same consistency. However, I would try this: Set your rice maker for steaming regular rice without using anything in the bottom (add your rice, water, salt; whatever you usually do to make rice). Once your rice comes to a boil and almost all the water is cooked off, but the rice is not sticking yet; invert all the rice out onto another container. 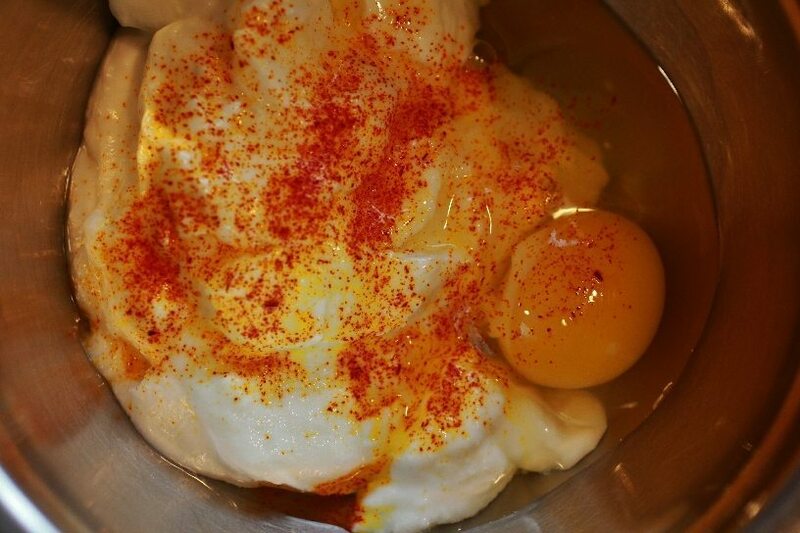 Keep the steam cycle going; quickly mix the yogurt, saffron and egg as per the recipe. Stir in the proper amount of cooked rice in the yogurt mixture, heat oils in the bottom of the rice cooker pot and cover it with the yogurt/rice mixture. Add another thin layer of the cooked rice sprinkled with rice spice. Next layer will be the chicken, and the last layer will be the rest of the cooked rice and a sprinkle of rice spice and the cubes of butter. Then cover and continue with the steaming cycle. I have never tried this, but it should work for you! Please write back and let me know how it goes! Thank you very mutch for your recipe for tahchin. I made it exactly as your instruction and I got a good result. I like to put a picture of my tahchin but I think it is not possible from here. Please keep in touch and write to me when you try my other recipes too. Have a great weekend. Hello Farahnaz; yogurt, or something similar to it, is the essential part of making the tahdig for this meal. If your concern is lactose intolerance, you will be able to use plain soy yogurt which should be a good substitute for dairy yogurt, though I have not tried it personally. You will be able to use the same amount as indicated for regular yogurt in the recipe. I hope this answers your question and I would love to hear back from you if you try this product in your tahchin. I have been looking for a Tahchin recipe for ages… thank you so much for posting! Quick question, and apologies if you have already addressed this question, but can you premake this dish? For example, can I make on a Friday, up until final baking point, to bake on a Saturday? Thank you!!!!! Hi Karen; You’re so welcome! I’m glad you’re going to try this recipe; however, I usually ask my readers to follow the recipe as written, at least once, before experimenting with different ingredients or techniques. 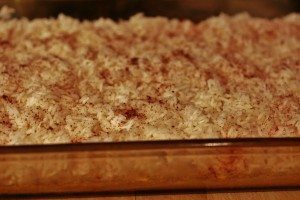 I’ve never made this recipe ahead of time, and wouldn’t recommend it, because the texture and flavor of both rice and chicken is going to be altered when refrigerated overnight. I don’t want you to go through all the trouble of making this and not get the intended result. Thanks for writing to me and please keep me posted with the results, if you decide to go ahead with pre making this recipe. This recipe looks delicious. Do you think it would be possible to make ahead and freeze before baking later in the week? If so, once removed from the freezer, how long would you bake? Hi Shandy, thank you; it is very tasty! To answer your question: Personally, I have never frozen tahchin, and generally speaking, cooked rice does not freeze very well (the grains crumble when thawed and reheated) and chicken is more tender and tastes best the first day that it’s cooked. With this in mind, if you still wish to freeze this tahchin, completely thaw the frozen tahchin in the fridge, then follow the recipe but bake it for an additional 10-15 minute, until the tahdig is a rich golden brown. I hope I have answered your question and please let me know if you have any further questions. This was the first Persian recipe I made for my other half (who is Iranian) and HE LOVED IT. He even said “hmm that actually tastes better than my mum’s” which was pretty awkward yet satisfying to hear. This recipe also got vetoed by my Iranian friends. Thank you Homa for this website . I love using it everytime I’m home to make family meals and it is always a success. Oh my goodness; that is such a nice compliment; my regards to your boyfriend 🙂 I’m also very happy to hear that your other Iranian friends like your tahchin as well. It’s a nice feeling to know that my readers can trust my recipes enough, to try and enjoy them! I thank you for taking the time to write to me dear Rebecca! Please keep in touch! My fiancé is persian and has been adoring when I cook him Persian dishes and Your recipes and directions have been amazing!! I’m making this dish tonight and he said he hasn’t had this dish in over 3 years and is so excited! Thank you so much for sharing these amazing recipes. I’m going to make your shirazi salad with this! Q: do I stir the chicken as it is boiling on med low with the top on? Or do I leave it alone and not turn it for an hour and a half? I’ve been turning occasionally. Hello Amanda; it’s a pleasure to hear from you and I’m likewise delighted that you’ve found my website 😉 You may turn the chicken pieces once halfway through cooking, if you wish, but you don’t have to stir it. Please let me know how this recipe turns out for you. Have a great evening and a fabulous weekend! Hi Rachel; any yogurt that is suitable for baking, will work for this recipe. Hi, what is the best way to reheat pre-made Tahchin (made the evening before), so that it will be as good as fresh? I’m afraid a day-old tahchin is NEVER as good as the freshly baked tahchin; however, if it is in the original baking dish, you could heat it up in the oven at 250 F degrees, until it’s nice and hot throughout; by this time the tahdig should also crisp up. Thanks for your comment and I hope you’ll be pleased with the result! Long back story: I moved to California with my family when I was 8. My mom never really enjoyed to cook. She did it because she had to feed us. She never really took the time to teach me her recipes because she just rather not be in the kitchen. Fast forward 36 years. Now she is terminally ill and I’m taking care of her. I’ve been using recipes I find online. I made this dish last Monday, and it touched my mom in a way you can never imagine. Neither of us can remember the last time she made it for the family. She keeps saying, “are you sure this is the first time you’ve made this?” Thank you for helping me keep my culture alive for my family. I appreciate your detailed descriptions and beautiful pictures. I plan on working my way through all your recipes. I’m sorry if I don’t rate or comment on every single one. I am busy taking care of my parents, husband, daughter, and pets. Dearest Mitra; I really appreciate your heartfelt comment! I’m deeply saddened that all of you are going through these challenging times; you’re an amazing person my dear! I’m very glad that you like this recipe and delighted that you’re planning to try more; enjoy them! Comments like yours reassures me that this blog has realized my intent of sharing recipes with people who love and cherish our heritage as much as I do. I wish you strength and patience, as I know you’re doing a phenomenal job taking care of your loved ones. Thanks for the recepie, I finally made it right. I wish I could include a picture, it looked so good. I’m cooking Tahchin for the first time. I’m going to eat it with my Freanch boyfriend. I think we’re gonna love it 😉 Thank you for this recipe! Hi Sayena; thanks so much for writing to me. Hope you and your boyfriend have enjoyed this tahchin recipe. Please keep in touch and have a lovely day. What do you recommend instead of butter and yogurt if you can’t use dairy in this dish? Elana, I apologize for the late reply; I’m currently traveling in Iran. You could replace the butter with your favorite cooking oil. Though I have not tried using soy based yogurt myself, I believe you will be able to replace the dairy yogurt with it. Please let me know how these products work for you. How would be the time of baking if I make 1/3 of recipie . Is the same tempreture OK? 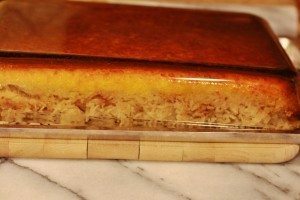 Salam Ranna; I bake the 1/2 recipe for the same duration as the full recipe, so I would suggest following the instructions for the 1/2 recipe as well, but check the tahdig after one hour for the right rich golden color. Enjoy!! I’m going to try this recipe today! Have never made Tahchin before, so I’m very excited to try it out. I enjoyed browsing through your website, great job :), I like it a lot that you can easily print out the recipe and you actually get something that is readable and in a nice format. That is wonderful Yasaman; it’s so good! I’m glad that you like my work! I know you’ll find many more of your favorites here; I would love to read your comments on the ones that you try. Happy weekend my dear!